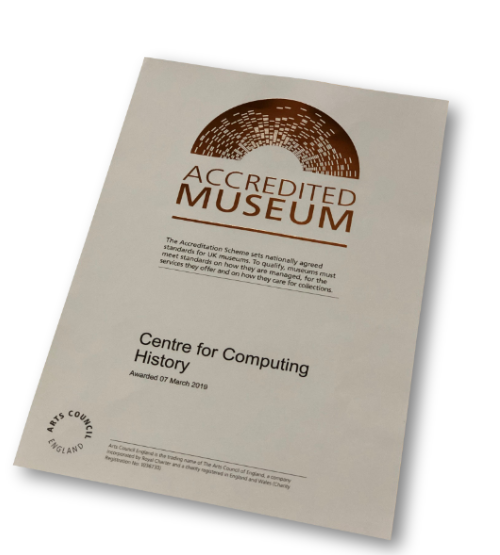 On the 7th March, the Centre for Computing History was awarded 'Full Accreditation' status by the UK Arts Council. The Accreditation Scheme sets out nationally-agreed standards, which inspire the confidence of the public and funding and governing bodies. It enables museums to assess their current performance, as well as supporting them to plan and develop their services. This is the culmination of 3 years of hard work in implementing documented cataloguing systems, preservation processes, development plans and working procedures, demonstrating that the organisation works to a high standard both in our preservation efforts and as a visitor attraction. "Achieving accredited museum status is incredibly important to our organisation. From day 0 the vision for the museum was to be completely hands on and interactive, and at that time, to my knowledge, there were no other museums with the same vision. But computers and game consoles demand to be used. A computer consists of hardware and software, and the only way to experience the software is to physically use the hardware. So to me, a museum with working and usable exhibits was the only way. BUT, many people and even some other museums assumed that because the exhibition was so hands-on that we weren't preserving the artefacts properly. Nothing could've been further from the truth. We were a young museum, but we already had thousands of items documented via our website and a collection of hardware duplicating those that were on display, that were preserved in the best way we could. This was done on an entirely volunteer basis. Now we have a collection of over 1,300 computers and game consoles, thousands more peripherals and over 38,000 software packages, games, manuals, books, brochures and more ... All catalogued online and physically preserved for future generations." The recent Heritage Lottery funded project to bring together, preserve, archive and digitise a range of LEO Computers artefacts and documents, further cements the museum as a serious player in preservation and dissemination of computing history. An ongoing and developing area of the museums work is the understanding of the chemical make-up of component materials used in computers. Plastics break down relatively quickly, sometimes seen as 'yellowing', where the colour of the plastic goes yellow over time. There is also the interaction of different types of plastics when in contact with each other. Known as 'cable burn', certain PVC sleeved cables will, under the right condition, 'melt' the ABS plastic that it is in contact with. At the same time some plastics will generate harmful gasses that can negatively affect other materials. Another problem area is batteries. Many vintage computers have internal batteries that store configuration information. Some will 'leak' over time causing harmful acids to damage the surround electronic circuits, so the museum is making a concerted effort to remove them and protect the machine from potential harm. The museum is on the front line when it comes to implementing working practices for these types of materials and is looking to further it's knowledge by working with other institutions. Museums Accreditation is not all about preservation. It is also very much about the organisation itself and being a visitor attraction. A large section of the documentation is about the structure of the organisation and our day to day working practices. Overwhelming positive feedback from our visitors helped very much in this respect. "When we originally founded the museum, I thought is was all about computers, but over time I have quickly learned that it is all about people. Not only in the stories that surround computing history, but in the museum itself. I am really proud of our team. I'd especially like to thank Jeremy Thackray, Harriet O'Rourke, Adrian Page-Mitchell and Lisa McGerty for their hard work in helping us achieve this. Also without the hard work of the rest of the staff and dedicated volunteers we wouldn't be where we are today. Thank you!" Jason Fitzpatrick (jason@computinghistory.org.uk, 01223 214446).